A “Normal” Winter in Wyoming? 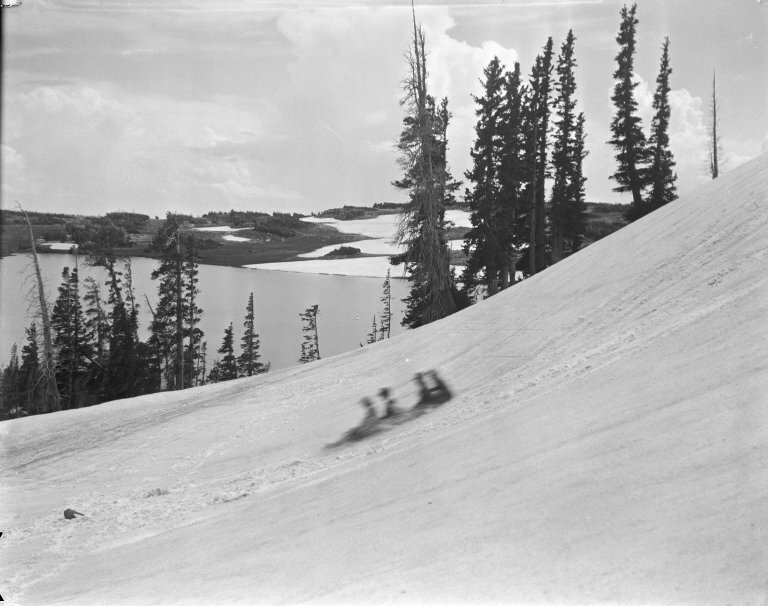 Four children on a sledding hill overlooking Telephone Lake in the Snowy Range. Ludwig Svenson Collection, Negative #14/32. With snowfall throughout the eastern part of the state hovering a levels below the average for this time of year, everyone has their brow furrowed over the chance of another crackling dry summer. While snowfall for the year is lining up with levels from the previous year’s, it’s still far behind typical levels. While the western part of Wyoming has received around average rates of snowfall this winter, the rest of the state has experienced winter drought conditions. Winter drought conditions are moderate throughout the state, and in some cases, have been termed “exceptional.” Winter precipitation is sorely needed to avoid another fire-plagued summer. Dryer conditions this winter have already led officials to issue a call on water rights for the North Platte River, according to an article in the Casper Star Tribune. Indeed, officials have reported that the Lower North Platte drainage area has received only 30 percent of average snowfall for this time of year, compared with 30 year averages. With lower water levels in rivers, streams, and reservoirs, fisherman may be wondering about the success of their next fishing trips. If dry conditions persist, campsites may again enact fire-bans and hikers may need to re-think their summer hiking routes. In short, bring on the snow–we need it! To help the weather along, we have scoured our collections for some photographs to help get Mother Nature in the mood to deliver a major snowfall. Downtown Laramie, Wyoming after the blizzard of 1897. 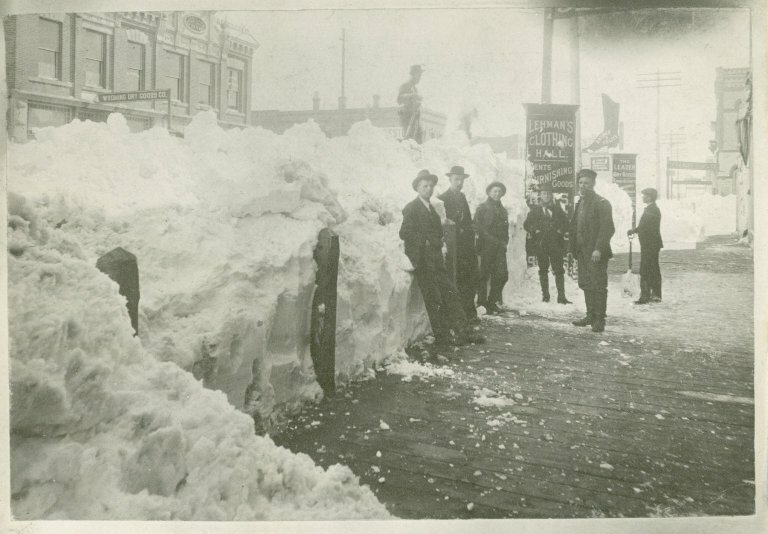 The image shows men standing with snow shovels next to a large drift outside Lehman’s Clothing Hall. Photo File: Wyoming – Laramie – Blizzard 1897. 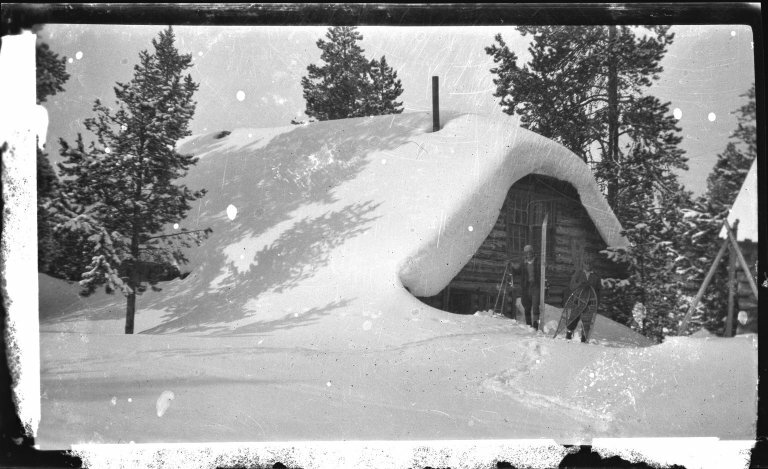 Two winter sports enthusiasts with skis and snowshoes outside a cabin. S. N. Leek papers, Collection #3138, Box 16. Here’s some inspiration to keep the snow going well after the first day of spring . . . 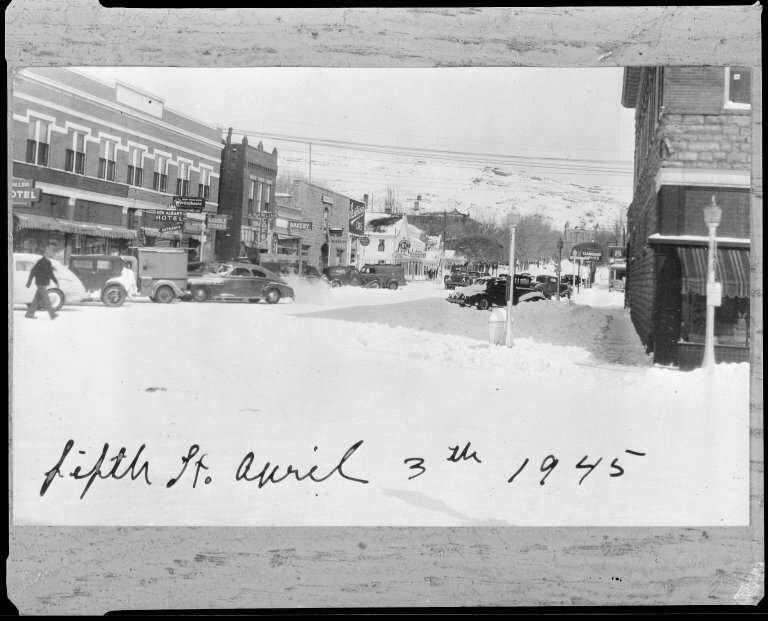 This image was taken in downtown Rawlins on April 3rd, 1945. Frank J. Meyers papers, Collection #5195, Box 8C, Folder 60. Think snowy thoughts . . . This entry was posted in Natural resources, Wyoming history. Bookmark the permalink. 1 Response to A “Normal” Winter in Wyoming? The second picture down — winter of 1897. That’s my great grandfather’s store — the shoe above the sign. It was the Leader dry goods store. The store is still there and it is now Cross Country Connection. Boy! do I give them a lot of advertising because it was my great grandfather’s store. Oh — he was William Henry Frazee. Thanks.